Arms going up on their own! 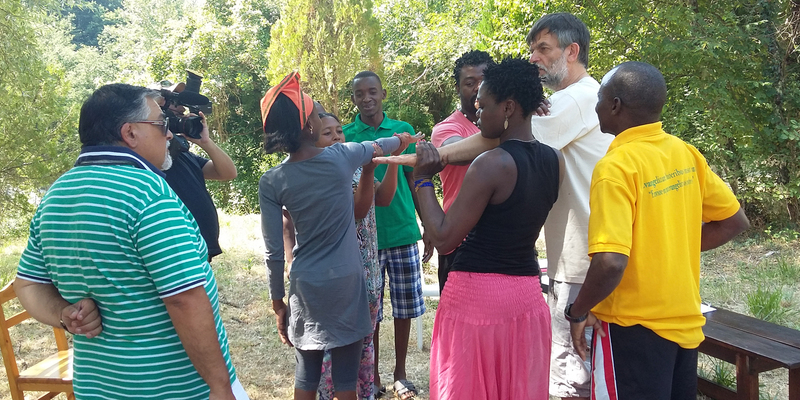 Morning with Jacopo Fo who proposes some Demential Yoga exercises to the Mozambicans. From arms that rise on their own thanks to the stimulation of involuntary muscles to catching thousand lire notes (it doesn’t work with 50 Euro cent coins! ), to arms that can’t seem to bend on their own. Jacopo amazes everyone with the pushing exercise: he becomes a tree that is well-rooted in the ground, he does a few tricks, and the result is that no-one can push him backwards. From exercises to theory, Jacopo begins explaining that our brain is in fact divided into two brains; one is modern, calculating, sensible, comparative, the other is ancient, ape-like, instinctive, spontaneous. Actors must act using the ape’s brain, only in this way will their performance be good enough. We, human beings with a modern brain, don’t know how to act, but our primordial side does. Have you ever escaped a dangerous situation and not remember what you did? You were acting with your ancient brain, which reacted instinctively. Mario Pirovano returns in the afternoon, and we go back to “The Hunger of Zanni”. The group has had the chance to read the text, study it, prepare a small piece. In fact, today’s interpretations are not at all similar to the initial ones. Someone even added their own elements, personal ideas. One month, 6 hours a day, on the same script, trying it, trying it again, and again, and again…whoever said that acting isn’t real work? Counting both the morning and the afternoon, the group does from 6 to 8 hours of training, with talks on theory and also practice sessions. Even this afternoon’s “lesson” finishes with one of Mario’s personal stories. The group continues asking for personal experiences, they are curious about life and the more details Mario adds, the more enthusiastic they become. During these first few evenings, the Mozambicans have been going to bed immediately after dinner. This evening, though, we find ourselves once again sitting in a circle, joking and laughing at each other. Mario hasn’t learned the group’s names yet: Arlete has become Ariete, Safina Salina, Agostinho Demetrio and this makes them (but also us) laugh a lot. Today’s typical Italian specialities are Aubergine Parmigiana and Panzanella. We also propose rice again and so, unbelievably, the Aubergine Parmigiana ends up on top of the rice.